Aug 3 2013 by J Simmons. As I mentioned in my last post, Mach 30 had a booth at the New Space 2013 Exhibit Hall. This was our first time as an exhibitor at a major space conference, and it was time and money well spent. We got to share our open source mission, demo two of our hardware projects, and meet some really great people. The display materials in the booth, prepared by our graphic design ninja and board member Rebekah McGrady, covered our mission, open source hardware, Open Design Engine, the Export Control Task Force, and our current open source spaceflight projects. One of the big surprises for me was just how well people responded to our mission. Just a few years ago we would routinely be greeted with blank stares when we explained our mission is to develop open source spaceflight hardware. This week I saw only one blank stare. And everyone else was so excited by open source spaceflight that I got more than one high five. I think part of the change in attitude was due to the fact that we had hardware to show. 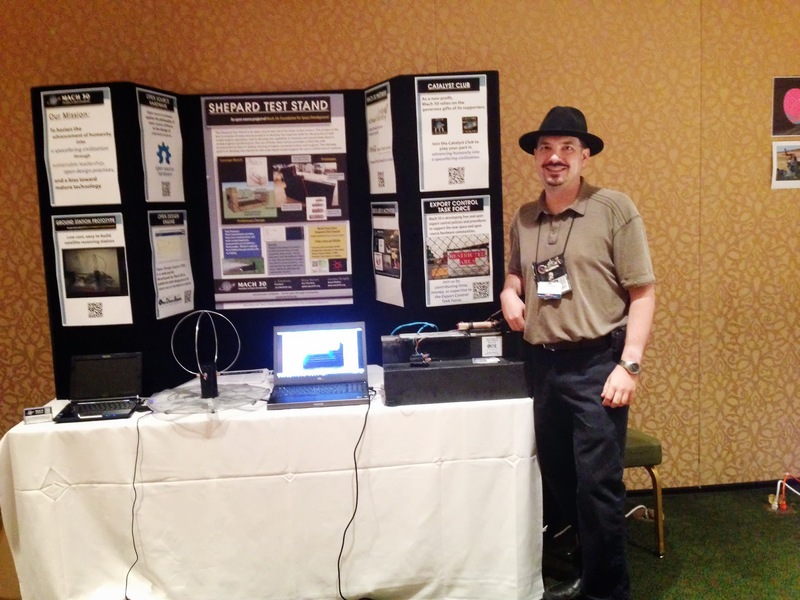 Our booth included demos of two of our projects: the Shepard Test Stand and our first ground station prototype. More than a few people stopped mid stride when they saw the hardware on the table. Those were always the best conversations. 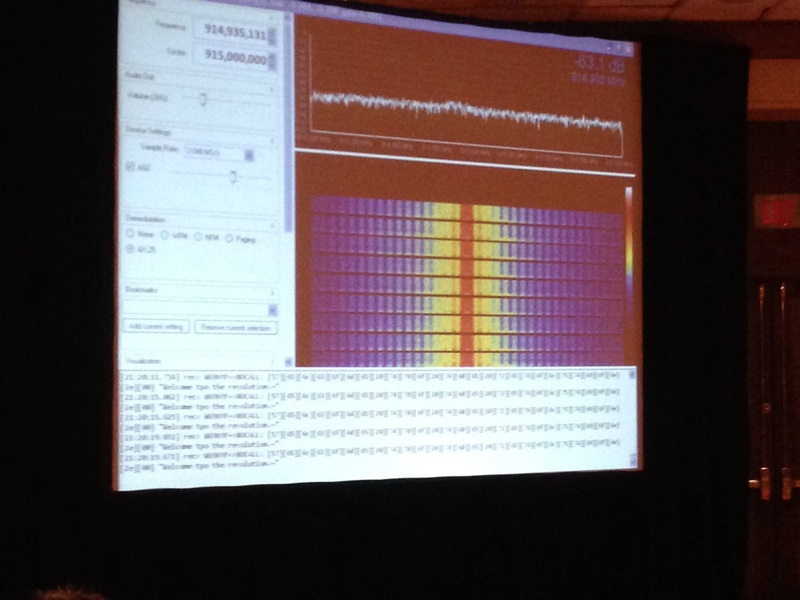 The feedback we heard from the attendees about our hardware projects was extremely valuable. For Shepard the big lessons were we should stick with the Arduino for our data acquisition system (teachers in STEM environments are already learning about Arduinos) and there is much more interest in Shepard at the collegiate level than I realized was out there. For the ground station the big lesson is just how much demand there is from individuals and educators for this version of the ground station. It is so high, I already have a number of emails already from people asking for a link to the project website. As is always the case when we attend conferences, I met a number of great people at New Space. First is Liz from the Space Frontier Foundation’s Teachers in Space program. They are running teacher workshops about spaceflight and raising money to send teachers on sub-orbital flights. It’s a great program and we are talking about how the Shepard Test Stand and other Mach 30 open source projects could be used in their workshops. Next is Reuben who I met over drinks Friday night thanks to an introduction by Ethan, a Mach 30 volunteer. Reuben has experience in fundraising and has been sharing links with me for the Revenue Generation Committee. Finally, last but far from least, is Tim from Southern Stars. Southern Stars KickStarted a cubesat last year, the SkyCube, and he brought the engineering model to the conference. It did not take the two of us long to realize he had a satellite and I had a ground station, and that clearly we should see if they could talk to each other. Within an hour we were sending messages from the SkyCube engineering model on one end of the exhibit hall to the Mach 30 ground station at the other end. And then, as if that was not cool enough, we decided to use the two projects to run an impromptu demo during a panel Tim was on later in the afternoon. Check out the very excited celebration of the demo over on Google+.